The Bosch L-BOXX 3 Carrying Case is part of a stackable storage system designed to improve tool organization and transportation on the jobsite. 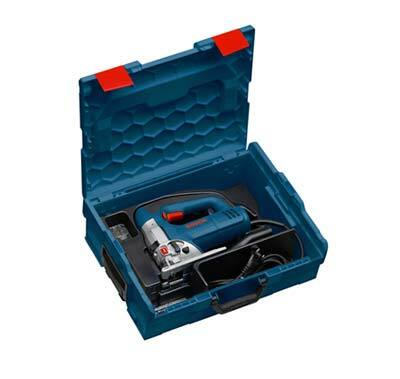 One of four different cases, the L-BOXX 3 is ideal for storing 18-volt cordless drill/drivers and compact system tools, with room for accessories. L-Boxx. With this carrying case, you simply click, stack, and go. Ideal for storing 18-volt cordless drills, drivers, compact system tools, and accessories. Stackable design is compatible with other L-BOXX cases. The L-BOXX system is a convenient way to expand your storage options as your tool collection grows. Fill the cases with tools and lock them together for easy transport, handling, and protection against damage. You can also stack and store them in your home shop to keep tools dust-free, organized, and easily accessible. Top, front, and side handles give you three carrying options for comfort and portability in all situations. The case's locking clips open quickly and lock down securely for theft protection. Fully crash tested, this case is built to last. It's also shockproof and water resistant to guard against the elements. The L-BOXX 3 Case measures 17-1/2 by 14 by 10 inches (length by width by height) and weighs 4-1/2 pounds, so it won't add extra bulk or take up too much space. I lucked out and got my order in right before this product went on review. I see that the description hsa changed to just case, but mine has the foam in it, and I am so glad it does. The LBOXXes are a great system and I am very pleased with my purchase. Having the foam allows me to custom fit my tools to the box. The Bosch website says the LBOXX 1 and 2 have the foam, the 1A and the 3 and 4 do not. (The 1A has the assorted bins ideal for holding screws, nuts, washers, etc). I highly recommend the system. Can't wait to get the upcoming LBOXX-3D with the 2 removable trays. I love that Bosch is now offering these handy carrying cases to help with organization and transportation of tools. These seem just as sturdy as competitive offerings and are much more cost effective. I am going to purchase a few more in the near future. A little tip: you need to remove the white protectors at the bottom to connect the boxes to one another. The Bosch series of tool carrying cases offer the most durability of most any other plastic case on the market. While somewhat pricey their construction and durability will not only protect your contents but are almost indestructible them selves. An added bonus is that they are adaptable to stacking with other LB series of cases. I own several Festool products, and quite a few Bosch 12v tools (7 I think...and love them). I'm glad Bosch finally jumped on the bandwagon of doing stackable tool containers (copying Festool's Systainer). The problem is, there are no inserts for these things, making them useless!! They don't make it easy to get them either for your specific tool. As cheap as the materials are for them, they should be selling the LBOXX, and have an order form in it to order online (free of charge!) the proper insert for my Bosch tool. I mean come on...I did just spend $60 on a plastic box....you can't send me a free foam insert that fits my tool and cost Bosch $0.12?? As an IT pro, I need to be ready to tackle a variety of projects on a daily basis. Keys to being successful and a true jack of all trades are to be organized and to be prepared. These LBOXX's are the coolest way to keep things organized and on the go. I'm not hunting for things in a big rolling box--I'm finding everything in it's place much more quickly. LBOXX-3: Network patch cables, surface mount boxes, and USB patches and extension cables. LBOXX-1 with Insert Set: Fasteners of all types for mounting racks, cabinets, and wall-mount brackets. LBOXX-1 with Insert Set: Networking tools, jacks, plugs, test gear, and such. LBOXX-1 with Insert Set: Drill bits and driver sets for masonry, steel, wood, and assembly. LBOXX-2: Makita 18v LiOn drill/driver, 18v LiON impact driver, charger, and 3 batteries. I ended up making my own foam dividers with leftover server packing material rather than shelling out another $25 for the LBOXX foam kit. Works well for me, and keeps things from rattling around. They all stack and lock nicely, fit very well in the back of my RAV4. With my setup, this stack can get pretty heavy--a folding cargo dolly does the trick. Sure, they are a bit pricey, but the cost is easily offset by how much more efficiently I can work, how easy they are to transport, and how easy they are to rack in my storage area. If you have a cargo van, these are compatible with the Sortimo shelf systems (since they are made by the same company). You'll also find that some new Bosch tools are now packaged in these boxes, so they fit right in with your setup. Quality is very good, and the insert bins with some of the boxes give you a lot of flexibility with your storage needs. I've got a bunch of these boxes, since Bosch "gave" me one with the 18V drill I bought. The ones I use to organize the dozens of boxes of screws and nails I carry with me (I'm a contractor) seem to be the best use. I still have reservations about the durability of the lid-closing latches, but in reality none have ever failed me. I'm also not thrilled with the fact that the top-mounted handle is attached only to the lid, and not the sides. It's fine when lifting only one box, but they get heavy fast when stacked. Also the latches that attach one box to another are difficult to line up, and typically take several tries. So the LBOXX works and is better than what I had before, but it's not perfect. I work in construction and drive an SUV so i don't have that much trunk space to spare. My tools were originally stored in canvas bags and they were taking up all the space in my trunk as well as the rear fold down seat since i wasnt able to stack the bags without damaging tools. I Bought an l-BOXX 1A,2,3, and a 4 to hold all of my tools and they worked fantastic! I store my Milwaukee m18 hammer drill, m18 Fuel impact driver, m18 right angle drill, a Dewalt 50 piece drill bit set, and my side handle for the drill. All of this fits perfectly in the LBOXX 2, without the batteries of course. The only negative i could see in the larger boxes like the 3 and 4 was that the sides of the boxes do flex a little so when you try and snap a box on top of the larger boxes one of the latches will lock but the other will sometimes flex to the side and will not lock. So look out for that or else you may try and pick the whole stack up without all the boxes being locked together. Would definitely recommend to anyone looking for a modular stackable storage solution.. I used to going for the tools that came with plastic cases, assuming they would give a safe way to store and transport. They do those functions well, but they do so at the cost of space, which is at a premium in my small home workspace. If I had the budget for a dedicated shop, I would probably find the Bosch L-boxx cases not as good a solution as they are. But they work great for my needs. The sizes are pretty wide, offering a good way to fit tools, from saws to sanders. If you have Bosch tools, there are inserts made for the cases, although they do not appear to be sold in the US at this point. I may order some pick and pluck foam, but for now find them to work well with the tools right next to one another when mixed (sanders in one box, etc). If you depended on the cases for your lively hood, the inserts or padding might be more important. I am slowly trying to accumulate L-boxx units to get rid of the tool provided cases I have, since they are mostly air (or plastic). They are pricey for certain, although less expensive than Festool's Systainers, but can be neatly stacked atop one another, including a wheeled base option. Personally I am not sure the wheeled base is worth the cost, so I will whip up my own wheeled bases out of some plywood with shallow vertical side pieces to help lock the bottom L-boxx in place. Anyway, the L-boxx units are plastic, but they feel sturdy enough for most uses. Not as heavy duty as some of the Dewalt offerings, but much more flexible in my opinion. I would not load them up with pounds of hardware, but for most tools they are more than capable of holding, protecting, and organizing your toys. They connect and disconnect easily enough, have large holds, and a big top mounted handle. Recommended.